Connect to your Shoppagina shop in a few easy steps! For connecting Shoppagina to your SendCloud account log in to your Shoppagina account. Log in and go to 'check and edit my shop'. Click on 'external connections in the left side menu. 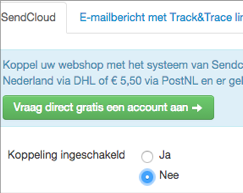 In the next screen choose: SendCloud in the sub menu 'Logistics'. After this choose 'Yes' at 'connection activated'. You will be redirected to the following screen. Here you can paste the API keys from your SendCloud account. When logged in into SendCloud you choose settings > connected shops and choose the SendCloud API key. Fill in a name as you wish and save. 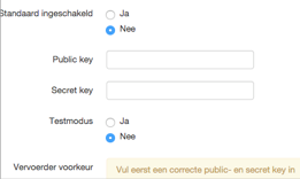 When you have saved the SendCloud API, the public & secret key will be generated. 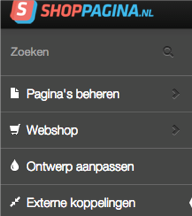 Log back in to your Shoppagina environment and choose in the left menu for 'Webshop' > 'Orders'. You will now see your order overview. Your orders will only appear in SendCloud when they have the 'payed' status. Your Shoppagina is now good to go! You can start making orders in the SendCloud account. 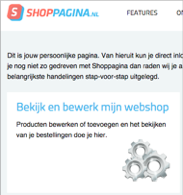 At 'Incoming orders' you can find your Shoppagina integration and import the orders from here to make a label.